Anglesey will always be the place to relax and find myself. I never understood why i have over the years found myself akin to lovely island, that was until i started to do the welsh side of my ancestery. relateing to my great-great-great grandmother Jane williams and her father. I went to the church where jane had her christening sadly the old church had been rebuilt twice over. There's lots of information you can find here, if you want to know more about your family tree. I will be returning later this year. Thank you , people of Anglesey. Sadly owing to ill health my holiday in Anglesey was curtailed in some ways so I was unable to continue my family history research. I was however able to still to visit the local shops and eat out at some friendly pubs. They were very understanding of my needs regarding my health so meals tasteful and yet so light. At one eating place the staff made me so welcome they even gave me a grand tour of the building a sort of a behind the scene so to speak. They were preparing for a wedding reception and the marriage was also to take place there at the same time. The staff gave me so much of their time even though they were so busy and I thank them for doing so. Every time I travel back for my holidays I find it so very hard to return home to Cheshire and yet I live in a lovely Cheshire town. This year I shall be coming back to Anglesey once again and seek out all the lovely folks who gave me so much of their time and patience on my last visit. People ask of me time and time again what is there in Anglesey for you ? why do you keep going back there ? , and I reply " you have to go and see for yourself, meet the folks and don't be afraid to be yourself because that is all they ask of you. Go and look and see for yourself ,and marvel at natural beauty and hidden treasure and the island its self steeped in so much history is worthy of the time spent researching it. J.M.K. 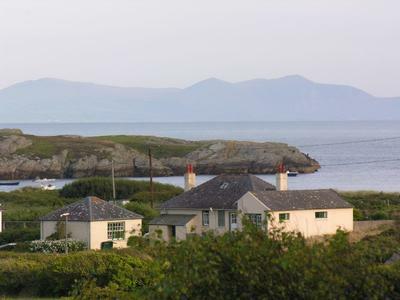 I shall be returning to Anglesey once again,in a few weeks time. I hope on this visit to search out some more knowledge relating to my ancestor, who was born near Holyhead,and later to be became a engine driver. One member on my absent family was christened CADWALADR,Family name JONES.Who moved to Liverpool in later life. I note this not a very common first name, so i am looking forward to researching the past. Please do not think this is the only reason i return again and again, I enjoy my holidays here so very much, this lovely Island hold for me all that i seek, warm welcoming people, peaceful calming influence, friendly pubs, and lastly good wholesome food. what more could i ask for. I am counting the days till my return. jmk.